Amitabha (Skt. 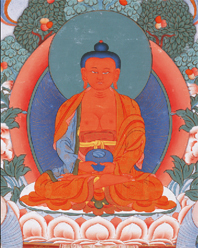 Amitābha; Tib. འོད་དཔག་མེད་, Öpamé or སྣང་བ་མཐའ་ཡས་, Nangwa Tayé; སྣང་བ་མཐའ་ཡས་, Wyl. snang ba mtha' yas) — the Buddha of Boundless Light, belonging to the lotus family (one of the five buddha families). The Amitabhavyuha Sutra tells us that many aeons ago, as the monk Dharmakara, he generated bodhichitta in the presence of the Buddha Lokeshvara. At that time, he made fifty-one vows to lead all beings to his pure realm of Sukhavati. This page was last edited on 9 February 2019, at 12:33.